In a rare Vancouver tour stop supporting their latest monolith of an album, Luciferian Towers, it was no surprise that legendary Canadian masters of the anarchist urban symphony, Godspeed You! 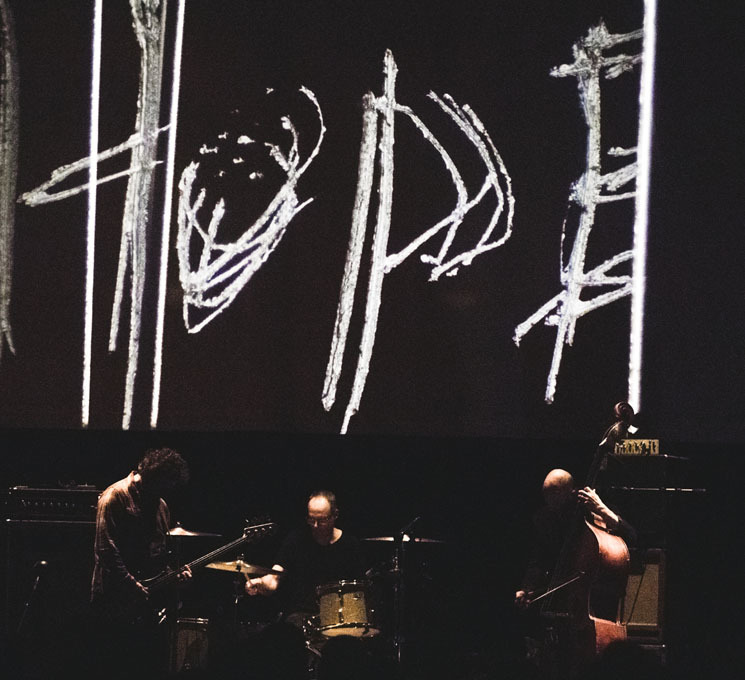 Black Emperor, played to a soldout crowd, packing in the Vogue theatre venue as hundreds had congregated to witness what has become a legendary spectacle. And they did not disappoint. Before the band took to the stage, what might have been a trio of guitarists were one in Marisa Anderson, a solo guitarist out of Portland, OR who stood alone, but nevertheless filled the space completely as she took to her strings with an almost alchemical mastery. Playing a melancholy style built from blues, country and folk, Anderson made it all look so easy as she evoked the desolation of desert wastes in "House of the Setting Sun," or the memory of female revolutionaries in "Bread and Roses." Whether her set was short or it just went by too quickly, it was sad to see Marisa Anderson depart the stage. As expected, when Godspeed took the stage, Vogue Theatre was thoroughly filled to the brim, every tier and level of the place packed full. One by one, eight band members appeared and began to play, layering on their instruments to what would become the rising crescendo of "Undoing A Luciferian Towers." In what has become a staple of Godspeed's shows, about six thrumming and clacking film projectors shot images overhead, displaying an evolving sequence of visuals that ran parallel with the music. It was a feast for the eyes as much as ears, as the technician running the projectors was changing and merging images on the spot, playing them like instruments and matching their evolutions to decisive beats or musical shifts. Shifting in the rustic grime of old film, scenes of haunting urban desolation fed into the music, giving it a greater impact, just as the music itself seemed to imbue the images with a heightened meaning in a mutual cycle of power. Nearly all of Luciferian Towers was played, but nearer the end of their almost three-hour set, Godspeed took it back to Slow Riot For New Zero Kanada in "Blaise Bailey Finnegan III." By the end, the eight members left as they had come: one at a time, yet the show was not over until the film seemed to melt onscreen.